The saying, “things are bigger in Texas” is true when it comes to making a piping hot, authentic bowl of True Texas Chili. There’s just no way to make chili for one or two. When you’re making this genuine bowl of goodness, you’re gonna need to make a lot because folks love it and they always want seconds and thirds. Chili Cook-Offs are quite a competitive sport in Texas…and you thought we were fanatics only about football? In Texas, on any given weekend, you’ll find some town hosting their annual Chili Cook-Off. The Grandaddy of all Cook-Offs is the Original Terlingua International Championship Chili Cook-Off held the first weekend in November in Terlingua, Texas. Here, you’ll find some of the stiffest competition around for a good bowl of red! What Kind of Beef Should I Use? 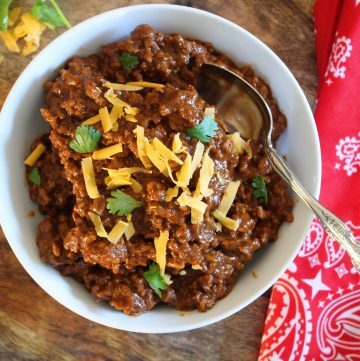 I usually us an 80/20 or 70/30 ground beef; I find the fat gives the chili a little more flavor; however, if you prefer a leaner chili, you can use a 90/10 ground beef, ground sirloin, or ground turkey. Ugh. This is a constant source of pain for cook’s everywhere… some are adamant about “no beans” others use pinto, kidney or black beans. It’s up to you. Beans add fiber and that’s a good thing. But traditionally, it does not have beans. Can I Add Other Ingredients? Yes! Sometimes, it’s fun to take this recipe and add a can of stewed tomatoes and green chiles, or jalapenos. I’ve even heard of some adding green bell peppers and a can of drained corn! Cornbread is frequently served with chili or, you can put some Fritos® in the bottom of the bowl and then you’ve got Frito® Pie! Chili the right way! Flavorful, easy to make and never enough! 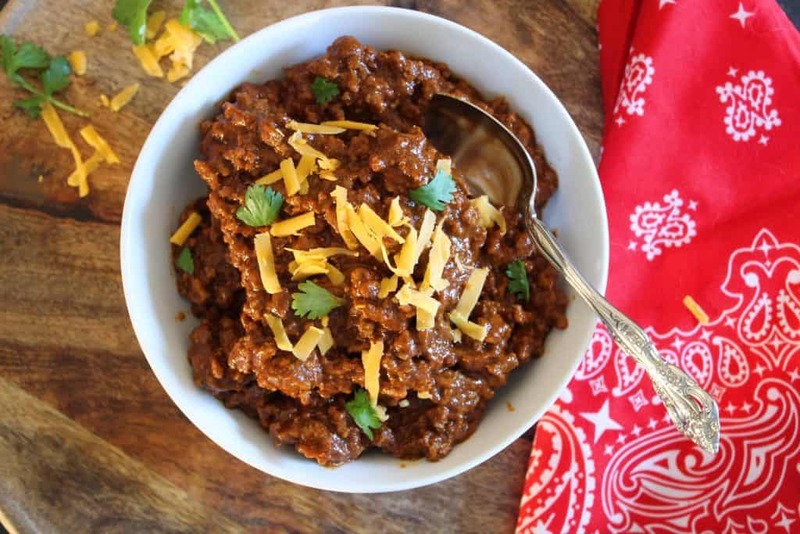 Make a big batch of True Texas Chili for your family and friends! After chili rests for awhile, heat it back up and re-taste it; this is when you can add more cumin or chile powder.